The history of the idea of ecology was effectively bifurcated into Protoecology and Modern Ecology when Ernst Haeckel coined the word ‘Oecologie’ in 1866. Protoecology encompasses the idea of a great chain of being plus natural history and Arcadianism. The Great Chain of Being embodies the twin principles of continuity and plenitude in nature. According to the metaphysics of Plato and Aristotle, the natural order is arranged in a grand scale or hierarchy, from simplicity and imperfection at the bottom to complexity and perfection at the top. The principle of plenitude holds that the natural order is filled with as many life forms as possible given the ontological limits of nature. The principle of continuity holds that the natural order is characterized by contiguity, so that there are no gaps in the chain of being—no missing links or possible forms left out. These are not testable hypotheses. Rather, they are assumptions. Another idea central to protoecology, which also has its origin in Plato, is that each thing in nature has a telos, or purpose, which resides outside of nature in a supernatural realm: the realm of eternal, immutable, immaterial forms that the natural world, due to the inherent mutability of matter, imperfectly mirrors. The multitude of forms are facets of one grand inclusive form: The Good. Thus, the natural world is an imperfect reflection of the Good. What makes this relevant to the history of ecology is not the supernaturalism of the forms, but the idea that nature is inherently intelligible. 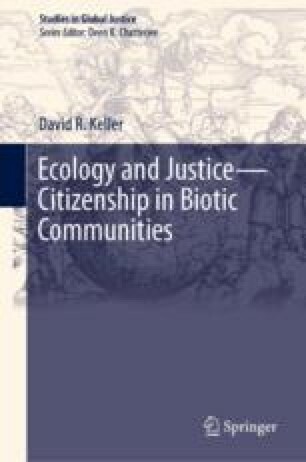 By making it intelligible to ourselves, we may hope to enable the development of an appropriate ethics for ecology. McCarthy, John, M.L. Minsky, N. Rochester, and C.E. Shannon. 1955. A proposal for the Dartmouth Summer Research Project on Artificial Intelligence. http://www-formal.stanford.edu/jmc/history/dartmouth/dartmouth.html. Accessed 11 NovemberNov 2011.